This is the second blog post for today, click here to see the first. 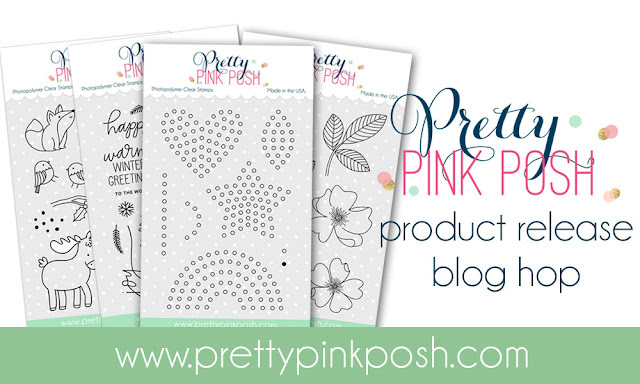 Hi friends, today I'm hopping along as a apart of the Pretty Pink Posh Product Release November blog hop. Today is the last day of a two day blog hop with a ton of inspiration using the brand new release. I hope you enjoy all of our creations! There are four $25 gift certificates to be given away in this blog hop (two per day). So make sure you leave comments on the blog's comments to be entered and they will then be picked randomly and announced on the Pretty Pink Posh blog. Make sure you leave comments by 11:59PM PST time on the 7th November 2017 to be entered into the giveaway! Okay, so now onto the hop. The entire list of designers participating for this day are linked below. Now that all the details are out of the way, for my card today I used the Sparkle Dot Patterns 1 stamp set along with Winter Woodland to create a dreamy winter scene. To begin my card today, I started off with a piece of watercolour cardstock and took the Sparkle Dot Pattern 1 stamp set and clear heat embossed the heart in the top middle of the cardstock. I then ink blended some Cracked Pistachio, Broken China and Salty Ocean onto the background in a sort of ombré way. I then flicked some water on top, picked it up with a paper towel and heat dried it with my heat tool. Then I went ahead and used my paper piercer to pierce holes in each of the holes that I embossed. Once they were all poked through I started stitching. I used some blue thread and did a simple back stitch through all the holes until the heart was full of stitching. I really love this stamp set, the possibilities are endless. I adhered the excess thread on the back of the panel and moved on to colouring. I coloured my images from the Winter Woodland stamp set with Copic Markers and die cut them with the coordinating dies. I then used the Stitched Borders 1 Dies to cut out two white snow hills. I adhered them down to my stitched panel using flat adhesive for the bottom layer and foam tape for the top layer. I then adhered my images down the same way. For my sentiment I used the Thank You die set, but just the You word from it and cut it out of white cardstock five times and adhered them together. Then adhered it on my card. 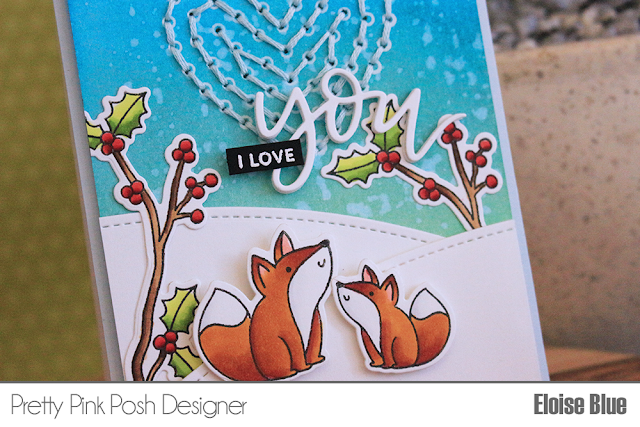 For the rest of the sentiment I masked the I Love sentiment from the Winter Woodland stamp set and white heat embossed it on a small strip of black cardstock and then adhered that down to my card also. I adhered the entire panel onto a piece of fun foam and then onto a light blue card base. Thanks so much for stopping by today, the next and final person on this blog hop today is the amazing Suzy Plantamura and make sure you leave comments to be entered to win the gift certificates! I’m obsessed with the winter woodland stamp set. Cute card. What a great idea to stitch on your card! Love the stitching and the critters! 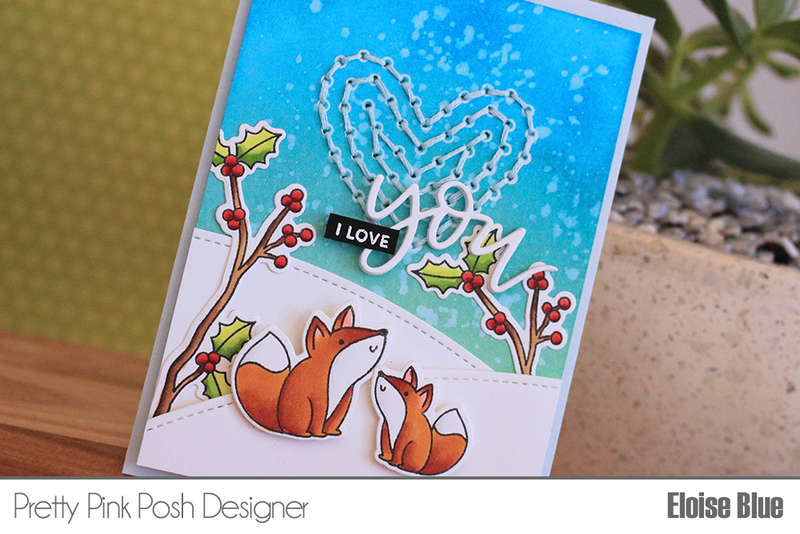 Beautiful card with a very clever use of the sparkle dot pattern stamp. Oh my, the stitched heart in the sky is so dang cute. It’s the perfect addition to this cute card. TFS. Love these critters. They are adorable! Your foxes are too cute!! 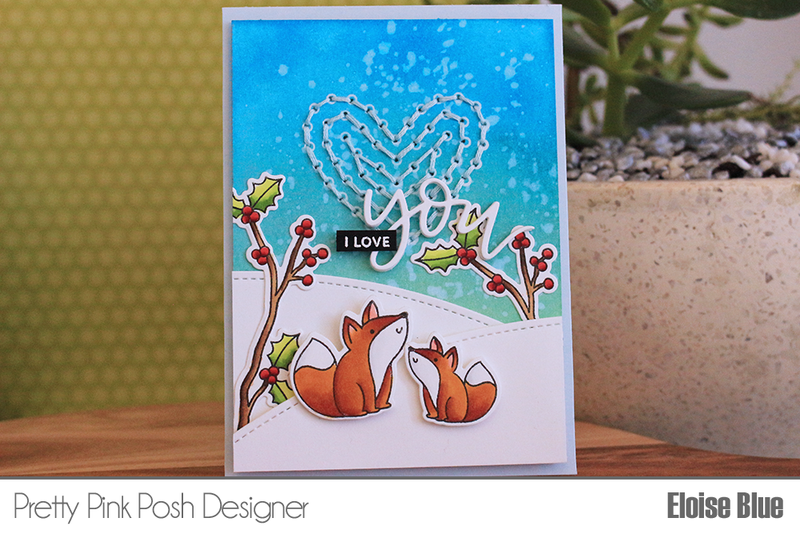 Love this card and the Winter Woodland stamp and die sets! Lovely card and stitched detail really sets it off nicely! And now for something entirely different again. Well done. Great work love both of your cards and the stitching is so creative! Wonderful design, I love your card, and the idea with stitching is so clever! Adorable idea with the stitching. Also did the names change for the blog hop??? Like In your post Cathy Zielske name isn't there anymore and a few others???!! beautiful cards! I esp love the stitched detail! Super cute card - love the stitched heart. Your stitching adds a wonderful sweet touch to the card. Oh, you are so clever with the stitching on the heart! I really enjoyed your creations. What a creative thing to do. When I saw the stamp I wondered if it was a die, and you made it one. Beautiful. Beautiful colors and attention to detail. Great job! Beautiful card Ella, love the stitched heart and I think these stamps are so versatile! That’s wild how you stitched the heart, fun idea! Awesome card!! What a sweet idea with the stitching. Your card turned out amazing! Loving these sets! What fabulous work you have there! Love the stitching detail!! Such a great card! Adorable card! I love your designs!! So cute. Love the addition of the stitched heart. Stitching the heart!! What a great idea! I love it. What a sweet scene ... and great idea to use the stamp as a stitch guide. The critters are so cute! The stitching with your perfect little scene is fab! What a fun and pretty card. I really like the holly twigs & berries. This is an adorable card ! The stitching is a great idea ! This is really a great idea! I love that stitched heart! Gorgeous and fun! Nice combination of the foxes and the heart!! This is aodrable and love the stitched heart...creative way to use the stamp set. Lovely way to use the Sparkle Dot stamp set. Stitching gives it nice texture. Awww!!! Your card is absolutely cute!!! Colouring is simply breathless!!! This is so creative! I love that you used the new heart stamp for a stitching guideline! What an adorable card. I like how you used the branches as twigs coming out of the snow. Very original.. Your cards are beautiful. I love the background colors and the foxes are so wonderfully colored in. Thank you for sharing your creativity with us. How clever! I would have never thought to use stitching. Very cute! what a great idea with stitching the heart. i love how uniquely you used several of the elements, like turning the holly branch into a tree. super creative use of all the elements. love it. This card is genius!! What a creative way to use the sparkle dot set! Reminds me of the lacing cards my kids had when they were little. Thanks for sharing your wonderful idea! Love your pretty, creative card. Darling card! Love the foxes! Oh so great! This card is fabulous and one I would LOVE to receive! Such a cute scene and the stitched heart is so sweet! Adorable card! The Woodland set is so cute! Love Love Love! I have the Winter Wonderland set in my get list along with the Joy Shaker Card Die, the Merry Christmas Script and the Gold Seed Beads! I would have never thought to use the branch the way you did! Genius! I love this entire release! Early Christmas present to me! You show sequins at the bottom of your post because that's where you usually show what you used on your card. I didn't see any sequins on your card or did I just miss them? I love your card and when I win, I want that wild animal set and the heart set. Those animals are so adorable you just want to hug them! LOL Your card is very colorful and you're coloring is really nice. I really like it. I can't do the I Love You because I don't have a die cutter but you do and you did it. I love how it makes the card pop. What a great card and thank you for showing it to us. Thank you also for giving us the chance to win something. I hope I win!